A giant mudslide at the Sankay Inn resort, two hours west of Rio de Janeiro, killed 22 and injured dozens, state officials said. (CNN) -- A stationary front continued for a third day Friday to pound Brazil's southeast coast with rain, turning Rio de Janeiro's picturesque hills into nightmarish scenes and raising the death toll to 45, state officials said. 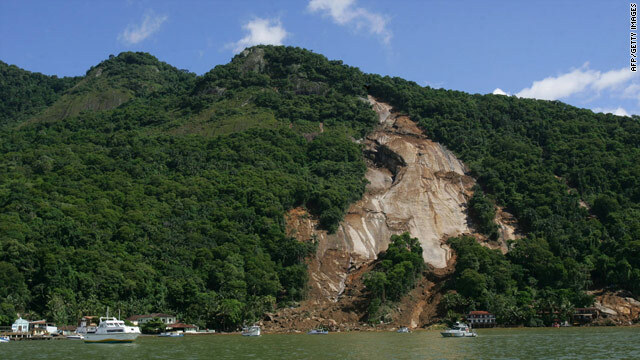 A giant piece of a mountain collapsed Friday into mud, which descended onto the Sankay Inn resort in Angra dos Reis, two hours west of Rio, killing 22 people and injuring dozens of others, state officials said. Rescuers found another 15 bodies floating on the nearby island of Ilha Grande, officials said. The mudslides struck the inn at 4:30 a.m. in the haven for wealthy vacationers and celebrities. At least 40 people had been staying there, CNN affiliate Record TV reported. Rio de Janeiro's State Governor Sergio Cabral declared three days of mourning and ordered the state's civil defense rescue teams on duty round the clock. The inundations began Wednesday. In nearby Jacarepagua, rescuers carried three bodies of a four-person family from the wreckage of their hilltop home after it was hit by a mudslide. Record TV broadcast the rescuers' attempt to find the family's toddler, Mariana. After sifting through rubble, the rescuers heard her cries emanating from underneath the rubble, dug her out and carried her to safety amid cheers. Brazil's President Luiz Inacio Lula da Silva told reporters he will send marine and naval forces to aid in carrying out rescues in remote coastal areas where more bodies are believed to be trapped.